ingredients: (Smoothie) 2 frozen bananas 1 T Raw Maca Powder 2 T Raw Cacao Powder 1-2 Cacao Paste Wafers (chopped finely or buzzed in a food processor for a second or two) OR 1 T Raw Cacao Nibs (leave Cacao Nibs whole and just top with them) nut milk to consistency desired pinch Pure Vanilla Powder (Almond Caramel Chunk) 3 T Raw Almonds, Enlivened Almonds, or Almond Butter 1/2 cup medjool dates, pitted pinch Pure Vanilla Powder water if necessary to blend to create: 1. Blend up all Smoothie ingredients (except Nibs, if using) in a food processor or blender and pour into a big (or two!) glass. 2. 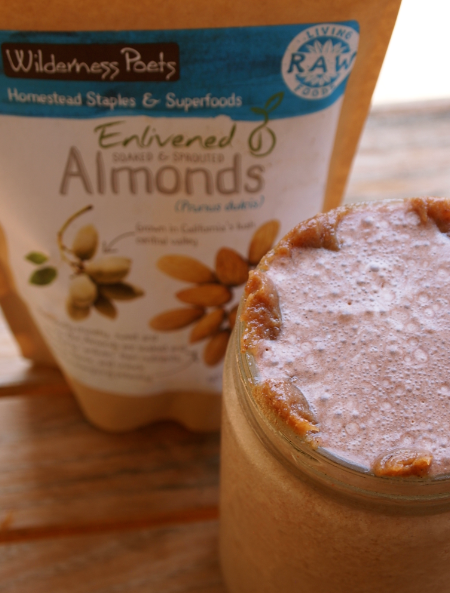 For the Caramel, blend almonds with dates and vanilla powder, adding a drip of water if necessary to encourage it to blend into a paste. 3. Fill a ziploc bag with the Caramel…smoothing it down to one of the bottom corners. Carefully, snip a triangle out of the corner, and pipe the caramel into the smoothie and on the edge of the sipper. Secret, sweet surprises! You can freeze the rest of the Caramel for another time.